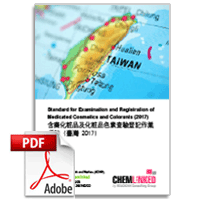 In Chinese Taipei, Food and Drug Administration (FDA) of Ministry of Health and Welfare is the competent authority regulating cosmetics. The authority enforces a series of cosmetic regulations including the overarching regulation – “Statute for Control of Cosmetic Hygiene”. In this statute, cosmetics refer to substance(s) for external use on the human body in order to freshen the hair or skin, to stimulate the sense of smell, to cover body odor or to improve facial appearance. Cosmetic products are categorized into general cosmetics and medicated cosmetics. Medicated cosmetics refer to the cosmetics that include ingredients listed in the “Standard List of Maximum Levels of Medical, Poisonous or Potent Drugs in Cosmetics” and adopted under the maximum level prescribed in the regulation. Cosmetics not containing medical, poisonous or potent drugs are regarded as general cosmetics. In addition, theoretically both categories are not permitted to use ingredients listed in “List of Substances Prohibited in Cosmetics”, but if the applicant could provide related documentations to prove the safety of the substances he could still use it. Cosmetics that include ingredients listed in the ‘Standard List of Maximum Levels of Medical, Poisonous or Potent Drugs in Cosmetics’ and adopted under the maximum level prescribed in the regulation. Regarding general cosmetics, both manufacturers and importers don’t need to file a record with the FDA, but the labels shall be indicated in accordance with the Article 6 in the “Statute for Control of Cosmetic Hygiene”. For manufacture and importation of medicated cosmetics, an application stating therein the name and content of raw materials, the name of any colorants used, and the usage of the cosmetic, accompanied by the label, leaflet, samples, package, container, certificate of analysis and relevant supporting documents shall be submitted to the FDA for examination and approval. Only after obtaining a license the applicant can manufacture/import and market the medicated cosmetics. 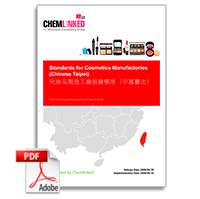 From 1 July 2013, manufacturers of medicated cosmetics are subject to reduced technical document submission requirements for examination and registration of their products on the condition that factories have obtained the voluntary cosmetic good manufacturing practice (GMP) certificate and the products have passed the inspection of cosmetic products of the same dosage and formula. Technical information, including the inspection specification, the testing method and report as well as the functional data do not require submission but are recorded for future reference by the companies themselves. 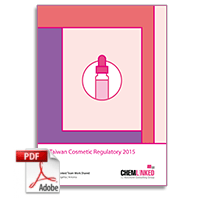 Before manufacturing or importing cosmetic colorants included in the “List of Cosmetic Colorants Allowed in Cosmetic Products”, the applicant is required to register with the FDA and obtain a license. 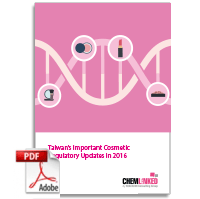 The procedures for registering cosmetic colorants are similar to the medicated cosmetics. 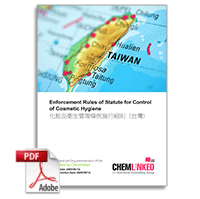 As for cosmetic colorant excluded from the list, if the maximum level of that colorant is prescribed in an EU, America or Japanese regulation, manufacturers and importers can use the colorant by referring to these maximum levels but shall submit relevant documents for proof during registration. The regulation stipulates the requirements for cosmetic labeling, instruction and packaging in Taiwan and attaches the reference format of labels and packaging.